Welcome to our second issue of Cloth Diaper Column, and our first ever Swim Diaper Edition! I'd like to welcome each and every one of you. If you're new to Cloth Diaper Column, here's how we'll work. Every month we deliver new information about cloth diapers straight to your inbox! We'll also pull in a timely article or two. So, to start it all off, we've got a quote to celebrate moms. Mother's Day may have come and gone (and we hope you celebrated in style) but we hope this will remind you that every day really is Mother's Day! 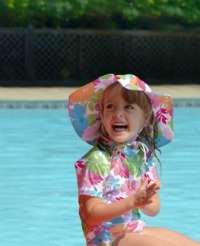 Are you planning to take your baby swimming this summer? Cloth swim diapers may be the absolute easiest way to get started with reusable diapers. Many pools are making swim diapers mandatory for children under 3. Even if your pool doesn't require it, or you have your own pool at home, cloth swim diapers are a great way to keep everyone safe and healthy. Whether you plan to to use cloth diapers or not, purchasing a reusable cloth swim diaper for your little one can make a ton of sense! Just like your own swimsuit, cloth swim diapers can be washed and used again and again. These special diapers can be used alone in place of a swimsuit bottom, or can be worn underneath another swimsuit. While there are several popular brands of disposable swim diapers, they can be very wasteful, and can add up in cost quickly. But the biggest challenge with disposable swim diapers is that they can be a challenge to get a snug fit on them once they're wet. Since swim diapers are designed only to catch poop, and not absorb urine, if they don't fit well, they might as well not be wearing anything! For more information, including why you should consider buying a special swim diaper instead of using one of your unstuffed pocket diapers, a tip on where to buy larger sizes of plastic pants (if your pool requires them), plus an overview of popular swim diaper brands in this complete article on cloth swim diapers. Many cloth diaper retailers don't have a huge selection of cloth swim diapers. If you're looking for a great selection, including the adorable iPlay trunks and tanksuits shown above, click here now to check out Diaper Junction. If you've never bought through Diaper Junction, use coupon code AFL550 to save $5 off $50 or more (some restrictions apply). They also have free shipping for all customers when you order $49 or more! Wet Bags - Perfect for the Pool! We never expected it, but one of the most popular articles on our website is our photo tutorial on how to make your own wet bag. If you know the basics of sewing, here's the perfect rainy day project that can be completed in under an hour. Make your self a large wet bag for a towel and swimsuit, or try making a smaller set for cloth wipes and a few diapers for day trips around town this summer! To check it out, click here. If you're not handy, Amazon always has a great variety of affordable wet bags, too! Are you worried about breathability with your PUL covers during summer? PUL is a synthetic fabric coating that is oh-so-durable and waterproof, making it a reliable choice for diaper covers. But as the temperatures rise, many parents with babies in cloth diapers worry about their baby’s comfort. For many, this worry is needless! Usually babies do just fine in their regular cloth diapers year round, even when the days get hot. But, if you notice more rashes or a sweaty hot little bum in your baby’s diaper, here are two ideas that will help you (and maybe even your little one!) sleep better. Wool is a very breathable fabric. Wool is not waterproof, but it is very absorbent. Are you thinking, “But isn’t wool itchy?” Change your minds, ladies! You should feel how soft some of these wool covers are. You can also look for second hand covers, or try to make your own with old wool sweaters. If sewing is up your alley, don’t miss this great cover tutorial from Adventures in Fluff. Etsy’s also a treasure trove for covers from “upcycled” wool sweaters. For more information on diaper covers, plus a special section on how to prep and care for wool diaper covers, see our article called Baby Diaper Covers Explained. If you’re not afraid of the odd dampness, why not let your baby go coverless? This option is also super breathable, and can work great if you use fitted diapers. Don’t forget, you’ll need to change your baby every couple of hours when they are coverless (or less depending on how quickly your baby soaks through a fitted diaper!) This can be a perfect solution for those hot days when you’re out of doors, but is not recommended for night-time use, when wicking to bedding and sleepwear would occur! We've got another chance to win coming up soon! We're taking part in the Summer Lovin' Hop, running from June 6-20, and we’ll be giving away an awesome Lil Helper Charcoal Bamboo diaper. There are a ton of cloth diaper blogs participating in this blog hop so you'll have several chances to win baby accessories. And the grand prize is a $1400 baby shower in a box, including my favorite stroller, the Zooper! Watch Facebook for a reminder to enter when the contest starts. Have you seen the new prints from GroVia yet? Click here to take a look. Which one is your favorite? Is it the adorable Bicycles (on a pale yellow), Peacocks (beautiful birds on a pink background), Robots (a cute blue with red and black astronauts, robots, and space ships), or Woodlands (woodsy theme on pale green)? Can you help us round up cloth diaper charities? We’re currently making a list for an upcoming feature article in our newsletter. Do you know one we should be aware of? Drop us a quick line or leave us a comment on our Facebook page, and we’ll be sure to include it! We're just getting started with our newsletter and would love your support! Please take a few minutes to encourage your friends to sign up to get our Cloth Diaper Column! We've made it easy, just click on this link to send this newsletter to a friend. As a working parent, I know how busy your life can get! I always find it much harder to make a meal plan during the summer. Need some inspiration? Check out this great list of meal ideas you can make up in a snap. I love the sound of the French bread pizza! Want to offer me some feedback, or do you have a question? Drop me a line, and I'll be sure to get back to you. That's all until next month! Thanks for hanging out with me! PS - Have you seen our Cloth Diaper Sales Round-up? Updated weekly to let you know about all the big sales, you can be notified about it each time we update when you follow us on Facebook.